I’m a big fan of Mendeley, the free reference and paper manager, available for both PC and Mac. One of the great advantages of Mendeley is that it happily keeps my work PC and my Mac at home in sync. Unfortunately though, while there is an iPad Mendeley “Lite” version, the iPad version does not (yet) allow you to annotate PDFs. And let’s face it – annotating is an important feature when reading papers! 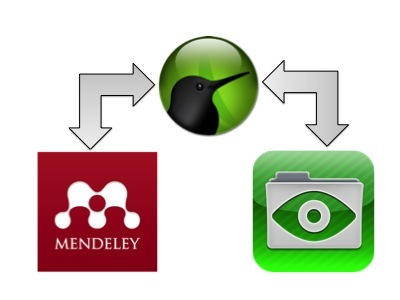 In the Sugarsync application, I’ve selected the Mendeley library folder as a synced folder (by default, on a Mac, this is located in “username > Documents > Mendeley Desktop”). Once synced to Sugarsync, I downloaded the Goodreader app for iPad. It’s not a free PDF reader – but modestly priced at £2.99. In Goodreader I added syncing with Sugarsync by tapping on “Connect to Servers” and adding Sugarsync from the box that appears. After filling out the account details, Goodreader asks you to located the folder(s) to sync (in my case “Mendeley Desktop”). 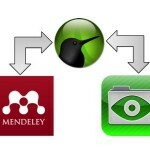 Once linked, Goodreader will download all of the papers from Mendeley. After reading/annotating or after adding new papers, simply remember to click sync and Goodreader/Sugarsync will nicely keep the Mendely Library updated with the annotated versions of the files. The result is that once I have a new paper, I just add it to Mendeley – and I can then take it with me on the iPad and annotate on the go. Hello – from Hull, Yorkshire! If you are mac user, try Papers. It’s very mac-style: easy to use and a great piece of software available for the mac and iPad. I shall give it a try and report back. Thanks, Matt! Thanks for sharing this handy tip for mac users. Thanks, Stephen. This is very helpful. My collection in Mendeley is very big now; about 5000 entries which makes the iPad app crash all the time. (At least I guess that’s the problem). The other problem with Mendeley for iPad and iPhone is that is indexes the documents eat time you load the app. this process takes ages. I am using iAnnotate which works very well for me. Thanks, but do you have a problem of the Mendeley linked files? I generated and put my database in the dropbox which is in cloud for synchronization. However, when I open Mendeley at home on my MAC, the file path shown in Mendeley is the one which generated on my PC in the office, like C:\Documents and Settings\… And on Mac it could not find such files, since the path for dropbox is different. Could you tell me how you synchronize the files on Mac and PC? It really annoyed me during past several weeks. 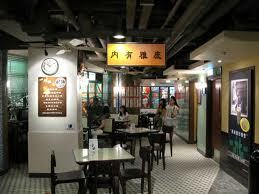 Next story Globalisation: Global Consumer Culture?